ww2dbaseJoseph Bech was born in Diekirch, Luxembourg in Feb 1887. He studied law at Fribourg, Switzerland and Paris, France and obtained his doctorate degree in law in 1912. In 1914, he qualified to practice law in Luxembourg. In Jun 1914, he was elected ot the Chamber of Deputies as a member of the Party of the Right. 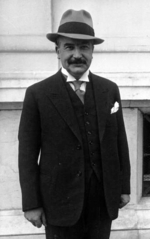 In 1921, he was appointed to Émile Reuter's cabinet as the Director-General for the Interior and Director-General for Education, and would hold these positions until Party of the Right's ouster in 1925. In 1926, he was made the Prime Minister of Luxembourg, and held that position until he resigned in 1937. From 1926, he had also held the concurrent duty of Foreign Minister, in which role he contributed greatly during WW2. From London, England, United Kingdom, he maintained relationships with other nations while his country was occupied by Germany. He also traveled to the United States, among other countries, to gather support for the efforts to liberate his country. In 1944, he was a signatory of the Benelux Treaty. In the same year, the Party of the Right was reorganized into the Christian Social People's Party, and Bech remained a leadership figure. Between 1953 and 1959, he was the Prime Minister once again. Between 1959 and 1964, he served as the President of the Chamber of Deputies. He passed away in Mar 1975. 17 Feb 1887 Joseph Bech was born in Diekirch, Luxembourg. 30 Jun 1914 Joseph Bech was elected to the Chamber of Deputies. 15 Apr 1921 Joseph Bech was appointed to Émile Reuter's cabinet as the Director-General for the Interior and Director-General for Education. 16 Jul 1926 Joseph Bech was made the Prime Minister of Luxembourg. 5 Nov 1937 Joseph Bech resigned as the Prime Minister of Luxembourg. 29 Dec 1953 Joseph Bech was made the Prime Minister of Luxembourg. 29 Mar 1958 Joseph Bech stepped down as the Prime Minister of Luxembourg. 8 Mar 1975 Joseph Bech passed away in Luxembourg, Luxembourg.